Mr. Miscavige in the lot’s historic promenade that reflects the intersection of L. Ron Hubbard’s history with the studio’s history. On its walls are the marquee billboards from the films and serials Mr. Hubbard scripted for Hollywood. Designed for global communication across every conceivable media platform—the Church’s new digital media center fulfills a dream long held by the religion’s Founder. Under David Miscavige’s guidance, the historic five-acre motion picture and television studio dating back to Hollywood’s earliest days has been meticulously restored, preserved and transformed into a fully integrated modern digital media production center. On May 28, 2016, more than 10,000 Scientologists and friends packed every plaza, parking lot and garage floor, patio area, sidewalk and other horizontal space on the Scientology Media Productions lot to reopen the landmark studio where L. Ron Hubbard himself once had an office during his career in Hollywood. Much of the world has yet to hear the Church’s own, true story. But that was destined to change as the May event unfolded. From its earliest days, the mission of Scientology has been to raise humanity to ever-greater awareness and abilities—and a key to accomplishing those goals has been the development of media channels and outlets for the Church. Scientology Founder L. Ron Hubbard was an author, photographer, scriptwriter and filmmaker, and his media background and knowledge is infused into Scientology’s central mission of worldwide expansion. Scientology Media Productions distills the mass communications energy of tomorrow into a single enterprise where Scientology’s goals of a more humane world are being communicated through magazines, TV, radio, digital platforms, special events, the internet and more. It gives the religion capabilities to deliver its message in ways never before possible. SMP’s array of online media includes live production and video-on-demand broadcasting; top-line streaming capabilities for computers, tablets, TVs, and internet-enabled devices; broadcasting and internet radio and podcasts; websites; social media—and apps that funnel all of those platforms to users. Scientology Media Productions is housed on a five-acre complex originally built in 1912. The studio includes state-of-the-art sound stages, creative suites, visual effects production areas, and facilities for editing, audio recording and mixing, foreign language translation and dubbing—and every other aspect of broadcast and online production. Most broadcast facilities started decades ago when technology was very different, and most adapted slowly to new technology. SMP is different, by design. David Miscavige re-imagined what the studio for the future would look like, building the facility to create and distribute the most cutting-edge content—all under one roof. Under Mr. Miscavige’s direction, the Church is similarly committed to maintaining this unique studio’s historic connections to the past. Ultra-modern offices coexist alongside meticulously-preserved hundred-year-old brick corridors. Staff devoted 400,000 man-hours of restoration work to preserving every iconic detail of this cultural landmark and its original glory from the Golden Age of Hollywood. The launch on March 12, 2018, of the new Scientology Network marks more than a milestone in the expansion and preservation of the Scientology religion. It represents a new era in communications, a planetary link that will bring the story of Scientology in the world to life. 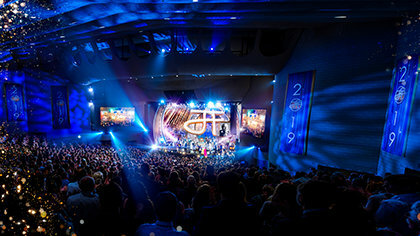 Before the launch of the Scientology Network, David Miscavige gathered the executive directors of Churches throughout the world, to give them a preview of the programming and to brief them on the global rollout. Programming on the network, aired over DIRECTV Channel 320 and through streaming services, includes stories of the real lives of Scientologists around the globe, conducting their daily work and making their contributions to society. It brings to viewers the history of the religion and its Founder and takes its audience inside the Churches across six continents, into the inner workings of Church operations and facilities, and tells the story of the evolution of Scientology from the philosophical studies of L. Ron Hubbard. 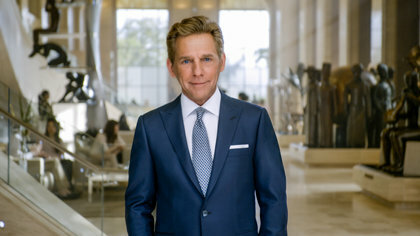 From Freedom TV broadcasts, bringing investigative reporting and public interest reporting to the channel, to documentaries on human rights, and profiles of those working toward humanitarian goals, the Network is a new voice, the Scientology religion’s own voice, broadcasting and streaming as never before, conceived and achieved under the direction of David Miscavige. Mr. Miscavige in one of the twenty editing suites at Scientology Media Productions. From the very beginning he imagined what the studio of the future would look like, and built a cutting-edge media facility for the conception, creation and distribution of content—all on a single lot.